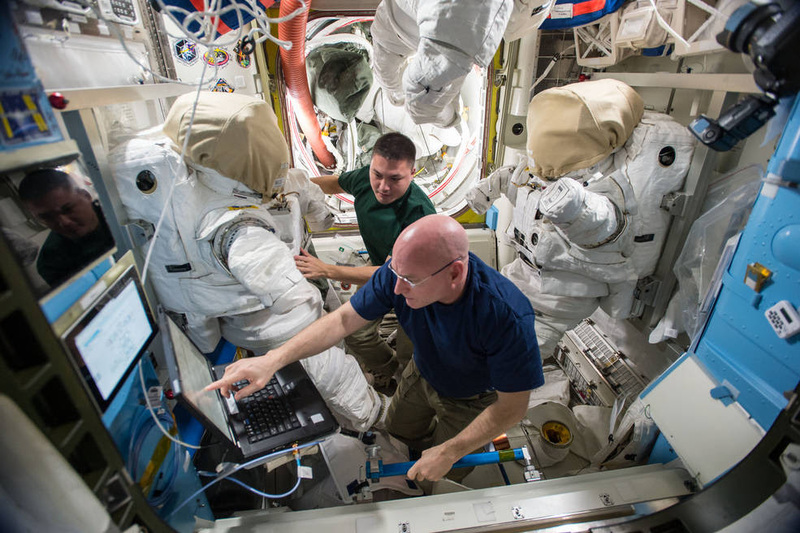 October 15, 2015 – In two weeks, NASA astronauts Scott Kelly and Kjell Lindgren will step outside the U.S. Quest airlock of the International Space Station for the first of two maintenance spacewalks. The spacewalks, the first of their careers, are scheduled for Wednesday, October 28, and Friday, November 6. NASA’s Johnson Space Center in Houston will host a briefing at 12 p.m. MDT (2 p.m. EDT), Thursday, October 22 to preview the tasks and preparation for the upcoming spacewalks. The briefing and spacewalks will air on NASA Television, and will be streamed live on NASA’s website. The first spacewalk, on October 28, will focus on station upgrades and maintenance tasks, including installing a thermal cover on the Alpha Magnetic Spectrometer, which is a state-of-the-art particle physics detector that has been attached to the station since 2011. NASA TV coverage will begin at 4:45 a.m. MDT (6:45 a.m. EDT), with the spacewalk scheduled to begin at 6:10 a.m. MDT (8:10 a.m. EDT). The spacewalks flank the 15th anniversary of continuous human presence aboard the space station, which is November 2. Lindgren earned a bachelor degree in biology from the U.S. Air Force Academy in Colorado Springs. He continued his education and earned a master’s degree in cardio-physiology from Colorado State University in Fort Collins and a medical degree from the University of Colorado. Lindgren was selected for the astronaut corps in 2009.